In 1968 the U.S. Congress passed the National Trails System Act. The legislation set a mandate for the establishment of a nationwide system of trails that would provide access to areas of scenic, natural, and cultural value and it established three designations, mirroring these types of resources: National Scenic Trails, National Recreation Trails, and connecting and side trails. The legislation envisioned a nationwide network that would connect trails in developed and urban areas to places of natural and cultural importance. Creation of the trails has involved the development of partnerships between federal and other government agencies, conservation and land trust organizations, private landowners and the work of volunteer and non-profit stewardship organizations across the county. The 1968 legislation created the system's first two trails, the Pacific Crest Trail and the Appalachian Trail. In 1978, an additional designation was created, National Historic Trails, and the country's first Historic Trails were created: Oregon, Mormon Pioneer, Lewis and Clark, and Iditarod (Alaska Gold Rush). And in 2009, the National Trails System Act was amended, and included a fifth trail type, the National Geologic Trail. h which such trails may pass." To create the vision of a continuous trail, the state legislation mandated a similar collaborative system developed from a network of partnerships and easements including state, local, and federal agencies, non-profit land trust organizations and private landowners. The legislation also articulated linking to the National Trails System. Former Secretary of the North Carolina Department of Natural Resources and Community Development (today's Department of Environment and Natural Resources) Howard N. Lee is credited with articulating the first vision for the North Carolina Mountains-to-Sea State Trail. In September 1977 while Secretary of the Department, Lee attended the Fourth National Trails Symposium at Lake Junaluska and shared his vision in a speech. Lee's vision for the trail, running across the state from state and local parks, through National Parks and National Forests, and across private lands involved more than simply access to the outdoors -- he imagined the trail also as a community development tool, a way of connecting people, perhaps in the same way trading routes and paths connected people in distant eras. 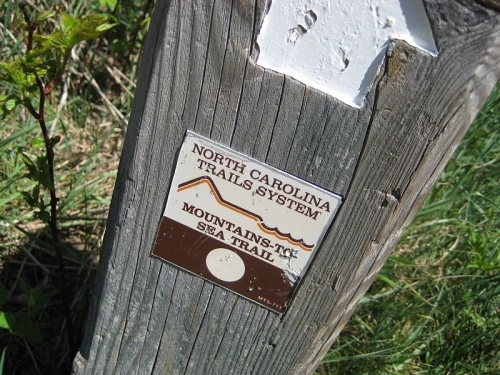 After nearly 25 years of study and development, the statewide trail, known as Mountains-to-Sea (MST), was authorized by the North Carolina General Assembly in 2000 (G.S. 113-44.1). The trail will be the template for a network of hiking, paddling, and multi-use trails which will connect natural areas to public greenways. The first segment of the trail, 70 miles from Ocracoke to Nags Head, was created in January 1981. Other early portions of trail added were in the western mountains of the state, from partnerships with the National Parks Service and National Forest Service, local governments, and lands administered by the N.C. Wildlife Resources Commission. To date, more than 500 acres of trail have been established. When complete, the trail will cross a planned 37 of the state's 100 counties and will run from Clingman's Dome in the Great Smoky Mountains National Park in Swain County to the height of the sand dunes in Jockey's Ridge State Park in Dare County. North Carolina State Parks. Mountains to Sea North Carolina State Trail. # (accessed January 17, 2016). North Carolina State Parks, Mountains-to-Sea State Trail. "Mountains-to-Sea North Carolina State Trail Master Plan." 2014. #wp-content/uploads/2014/09/MST-Master-Plan_webfinal.pdf (accessed January 17, 2016). American Trails. "The National Trails System." http://www.americantrails.org/resources/feds/40yearfact.html (accessed January 17, 2016). National Park Service. "The National Trails System Act" (P.L. 90-543). http://www.nps.gov/nts/legislation.html (accessed January 17, 2016). National Park Service. "National Trails System." http://www.nps.gov/nts/nts_faq.html (accessed January 17, 2016). De Hart, Allen. 1997. Trails of the Triad: over 140 hikes in the Winston-Salem/Greensboro/High Point Area. Winston-Salem, N.C.: J.F. Blair. Friends of the Mountains to Sea Trail. http://www.ncmst.org/ (accessed January 17, 2016). North Carolina Division of Parks and Recreation. "North Carolina State Parks Naturally Wonderful." December 2013. http://digital.ncdcr.gov/cdm/ref/collection/p16062coll9/id/156299 (accessed January 17, 2016). North Carolina Department of Environment and Natural Resources. "A Conceptual Plan for North Carolina's Mountains-to-Sea Trail: Falls Lake Dam to Cedar Island." April 2004. http://www.ncparks.gov/sites/default/files/ncparks/37/MST_East_Conceptua... (accessed January 17, 2016). National Trails Symposium. 1977. Expanding America's trail system an investment in energy-wise recreation : fourth National Trails Symposium, September 7-10, 1977, Lake Junaluska, North Carolina. [National Trails Council]. North Carolina Division of Parks and Recreation. [Illustration of the planned Mountains-to-Sea trail corridor.] "North Carolina State Parks Naturally Wonderful." December 2013. http://digital.ncdcr.gov/cdm/ref/collection/p16062coll9/id/156299 (accessed January 17, 2016). Omarcheeseboro. [Mountains-to-Sea trail signpost on the Blue Ridge Parkway.] Photograph. May 21, 2008. Used under Creative Commons License CC BY-SA 3.0, from Wikimedia Commons. https://en.wikipedia.org/wiki/Mountains-to-Sea_Trail#/media/File:Mountai... (accessed January 18, 2016). Hello, I am Joseph Hicks a member of the governing board of Elkin Valley Trails Association in Elkin, NC. I am writing in regards to the brochure of the Yadkin River Trail that has the links of the Yadkin River State Blue Way trail, Over Mountain Victory Trail, Mountains to Sea Trail that all intersect here in Elkin, NC. I am wondering about possibly updating the brochures that are probably are outdated by about 12 years at least. Since that time the Low water Bridge at Rockford has been removed and now does not require portage around that structure, several more changes as well. Thank you for visiting NCpedia and especially for sharing your post. I am replying to you at the email address you included with your post.